Ting, Tang, Wally, Wally, Bing Bang!!! Adam and all other in need of dishwasher advice her it is from the old property manager. If the basket at the bottom of the drum is clean and free of items such as melted plastic and dental retainors. Run your dishwasher through empty with 3-4 Tbsp Tang dissolved in a cup of water. Vinegar and bleach also work depending on your water type. Its amazing what Tang will eat away. I think you used to drink it as a child. Love to all. Karma came Back and Bit ME! Betsy very nicely packaged up all her kids' Nerf and disc firing toys. 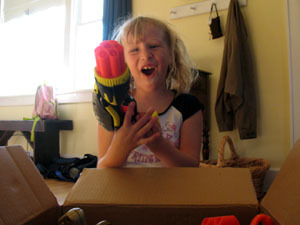 Emma eagerly opened up the box and was thrilled to see the contents. We're having some issues getting the new darts fit into the old weapons, so some modifications may be in order. We managed to tape a little toilet paper around an old dart and that did the trick too. That approach does have a high possibility for messiness, however. My boyfriend Bob, met with his oncologist on Monday after the prescribed regime of chemotherapy and radiation and was informed that the cancer was no longer evident anywhere in his lung and there were no signs of cancer migrating to his brain. This is great except that only 1 out of 5 small cell cancer patients makes it 5 years without the cancer coming back. So there is as always good news and bad news. Just hope and pray for the best.